Survivor: One World (2012) - 11th place, 8th out - 2nd juror. Voted out in Episode 8, "Just Annihilate Them" (Day 22). One World Ep. 2 RC: "DIY Knots" - Sits out as Manono wins. One World Ep. 3 RC: "Shut Your Trap"- Doesn't get a chance to compete, as Manono is swept by Salani, 5-0, before his turn comes up. One World Ep. 3 IC: "Ow Pairs" - Manono loses again (after Salani copies Manono's puzzle). One World Ep. 4 RC: "Coco Connection" - Michael connects on one hit, but Manono loses. One World Ep. 5 IC: "Basket-brawl" - Pretty much single-handedly responsible for a convincing Salani win against the old, slow, tiny new Manono. One World Ep. 7 RC: "Sea Turtles" - Part of the losing team (with Kim, Leif, Tarzan, Jonas, Kat). One World Ep. 8 RC: "7UP" - Part of winning team this time (with Kim, Leif, Christina, Sabrina). One World Ep. 7 IC: "Roller Ball" - Third person out, in the second round (10th/12). One World Ep. 8 IC: "Odd Shaped Bottoms" - just short of advancing to the final round (6th/11). One World, Ep. 7: Two votes, from Jonas, Leif. One World, Ep. 8: Seven votes, from Kim, Sabrina, Chelsea, Kat, Troyzan, Leif, and Jay (voted out, 7-2-2). More pre-season posing. Alas, the camera's interest was doomed not to last. Michael steals Salani's stuff in the opening seconds. In punishment for this act, he was not shown again for the entire season. Oh, my tribe has two guys that call themselves Tarzan? That's wonderful. Just broin' it up, bro. Oh good, Salani won again (Ep3 IC). Basket-brawl, Ep5 IC. Somehow managed to get a shot off against Leif. This is not a favorable matchup (for Manono). Rob Cesternino at RHAP (4/5/12): "We Get Michael Jefferson's Side of the Blind Side"
Gordon Holmes at XfinityTV (4/5/12): "Survivor: One World Castaway Interview – Michael Jefferson"
Daniel Fienberg at HitFix.com (4/7/12): "Michael Jefferson talks Survivor: One World"
Jeff says: Michael's going to go down as a villain. Straight out of the gate, he was stealing things from the women -- which is fun, funny, legal, and a great move, all good qualities. I don't know if he can be the likeable guy that says, 'I was just playing the game'' or if he's just an aggressive, just-strong-arms dude." "Inspiration in Life: My dad is my hero. He is the man I want to be like. I have learned so many great skills from him that I'll have for a lifetime. Hobbies: Working out, kayaking and soccer. Pet Peeves: Annoying eaters, bad breath, people who grunt while working out, and people that "need" a cigarette. 3 Words to Describe You: A leader, ambitious and organized. 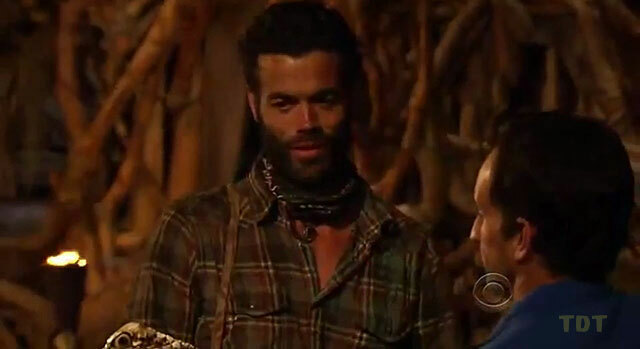 Survivor Contestant You Are Most Like: First, Ethan since he played a very clean game and did very well, and Rupert, because I speak my mind from my heart, not my head. Reason for Being on Survivor: It's my mom's dream (Survivor is her favorite show) for me to be on and win. Also, I see it as my chance to travel to a new part of the world. Why You Think You'll "Survive" Survivor: I am a natural leader who knows when to keep my mouth shut. People always listen to my opinions and I am a hard worker. I am very much a people person and with all the back-stabbing that goes on with Survivor, I don't see it happening to me. Why You Think You Will Be the Sole Survivor: I am a very driven person and can usually get what I want. I am a natural leader but will gladly step aside to take the spotlight off of me. I am also a very persuasive person who has learned to keep your enemies close so that it's easier to control and predict their movements. I am unstoppable!!"